Today we are really excited to bring you another new addition to our group, Yoshi Stokes of Prefectly Random Designs (http://randomprefect.etsy.com). Yoshi is a young printmaker and jewelry artist who uses a recycled material in her jewelry that at least a few folks out there might be familiar with. I’m a part time art student attempting to avoid ‘real’ employment by selling my handmade jewelry and prints. What kind of artist are you? And what first drew you to that particular medium? I can’t really pin myself down as any particular sort of artist. I dabble a bit in everything, but I’m focused on printmaking and jewelry at the moment. I was first drawn to printmaking as a way of making greeting cards, but after making and printing my first plate I quickly forgot that plan and just fell in love with the process. Jewelry has always been an interest for me. I finally got serious about it after taking a class at College of Marin. The use of vinyl first came along when I wanted to make a silhouette to match some earrings I had just bought, while looking for a material to cut it out of I found a broken record on my garage floor and thought, “I bet I could cut that!” Vinyl is cheaper than any type of metal so I can produce and sell my work affordably. Not much else. If I’m not doing jewelry or printing, I’m doing something else like sewing or painting. Other than that I love restoring old furniture and I spend a lot of time watching TV or reading. Who is your greatest creative influence? My mind does things and my hands follow. In my first jewelry class I made myself a pair of simple silver rings, I’ve worn them almost everyday since. They mean a lot to me. What is it about living in the North Bay that most inspires your creativity? Good weather, the trees, the water and the sunsets. Pretty much where I am now, but in a small live-in studio. After you’ve checked out Yoshi’s work, click over to check out her mom, Sally’s interview here on the blog. As you may know, Marin Handmade is very excited to be returning to Art Works Downtown again this year with another Evening of Art and Craft in 2012. The event is next Friday, October 12 from 3:00 p.m. to 8:00 p.m. and while we have many artists returning from last year’s event, we are please to welcome a few new faces this Fall. 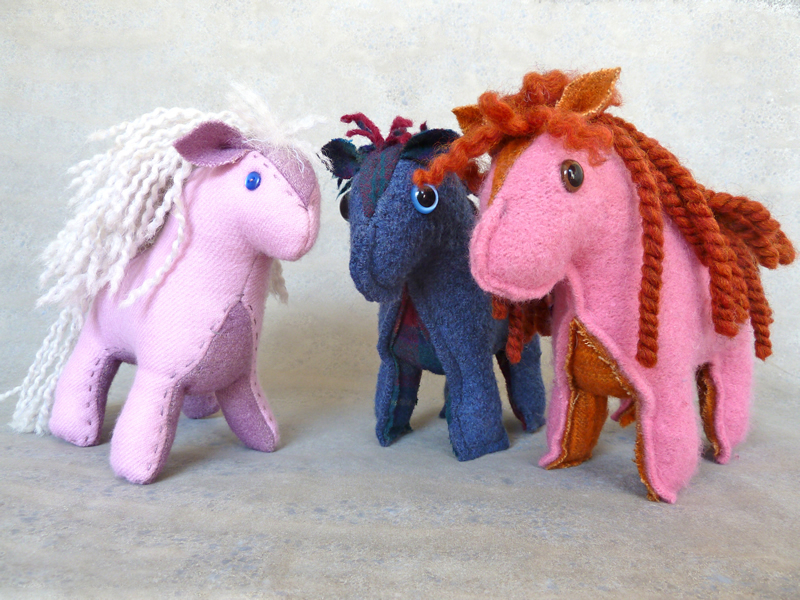 Today we start with an interview from Karen Giles Designs (www.LuxeFabricandYarn.etsy.com). 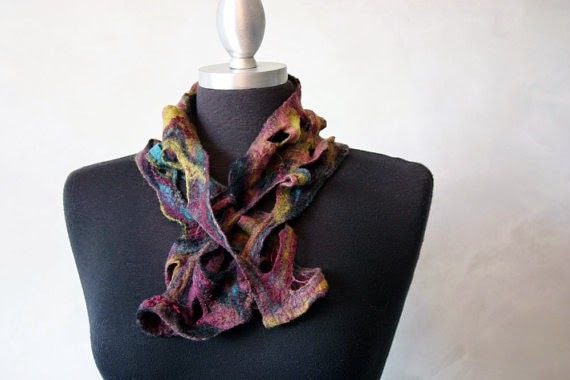 Karen knits and sews the most luxurious scarves from both new and upcycled yarns and fabrics. We think you will find her to be a truly inspiring addition to our group. I first learned to knit in high school. I took a long, long hiatus, then learned to crochet. After another long hiatus while raising kids, I am now addicted to yarn and knitting…just can’t get enough. In addition, I sell the leftover fabrics of a Bay Area art-to-wear clothing designer and sometimes rescue her scraps and fashion them into something unique and wearable. My sewing skills are less than I would like them to be, but I’m learning! Textile artist. I LOVE color, texture, fabric and fibers. Could just roll around in them all day! I work as a personal assistant/business manager for a woman who is a philanthropist. I’m also very fitness oriented and teach both Pilates & Yoga, as well as taking Zumba classes and weight training several times a week. Right now, I’m loving Jane Thornley’s free range style of knitting – it speaks to my inner rebel who yearns to break the rules and I love the idea that there “are no mistakes.” I’m trying to learn to make my “mistakes” work for me as part of the design process. 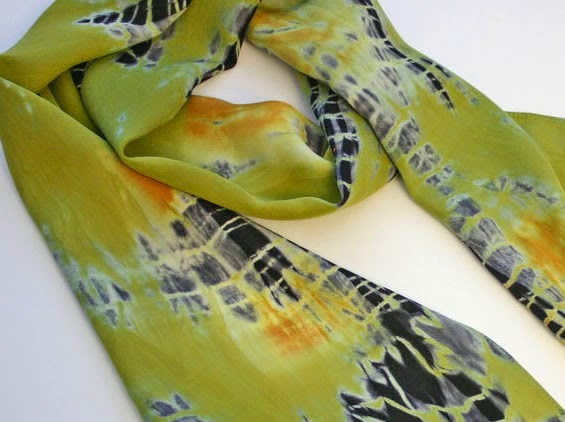 I also love Gina Wilde’s shibori-style knitting. Catherine Bacon, the clothing designer, is always a source of inspiration with her creativity and unique way of putting fabric and colors together. I just get ideas. I am inspired by seeing other people’s creations. Nature, colors, etc. all inspire me. My favorite thing to do is start a new project! What I cherished the most is no longer with me, unfortunately. My first crocheted afghan…took me over a year to make…and “disappeared” just before I moved from Hawaii to the Bay Area. So sad. Ahh…our beautiful open spaces, the colors – the green hills against brilliant blue sky in the early Spring; the burnished gold hills in late summer; the misty foggy mornings, with the shadows of our hills peeking through…and there are so many other wonderful artists here in the North Bay. It’s like living among many kindred spirits, even though you might not have yet met them. Retired from my day job, living in a beautiful remote area, spending all my time creating, doing yoga and whatever I want! Well, the interviews just keep on coming! Kaelen was one of our guest vendors for our 2011 October show. After meeting her for the first time Friday and seeing her work in person, I can assure you that if you didn’t come to the show, you should check out her shop on Etsy right away. Kaelen Van Cura of Kaelen Rose Paper Works (www.kaelenrose.etsy.com) brings not only humor and charming illustration to her cards, but she combines those with stitchery for truly unique collage works functioning as both gift cards and tiny works of art. I am an artist originally from the Midwest, and moved here two years ago. I got my Bachelor’s in Fine Art from the Kansas City Art Institute, where I majored in Painting. I primarily create colorful, pop-influenced abstract paintings, but for the past several years, I’d been making sewn greeting cards for my friends and family. About last November, I decided I’d try to sell the cards, so I entered a one-day show in San Francisco and did really well, and then opened my Etsy shop a month or so afterwards. What kind of artist are you, and what first drew you to that particular medium? Besides painting and creating my greeting cards, I also have begun making fascinators and clothing. I actually made my dress for my wedding, which took place a couple weeks ago (September 24). I enjoy creating in general, so I have a hard time keeping to a single medium. 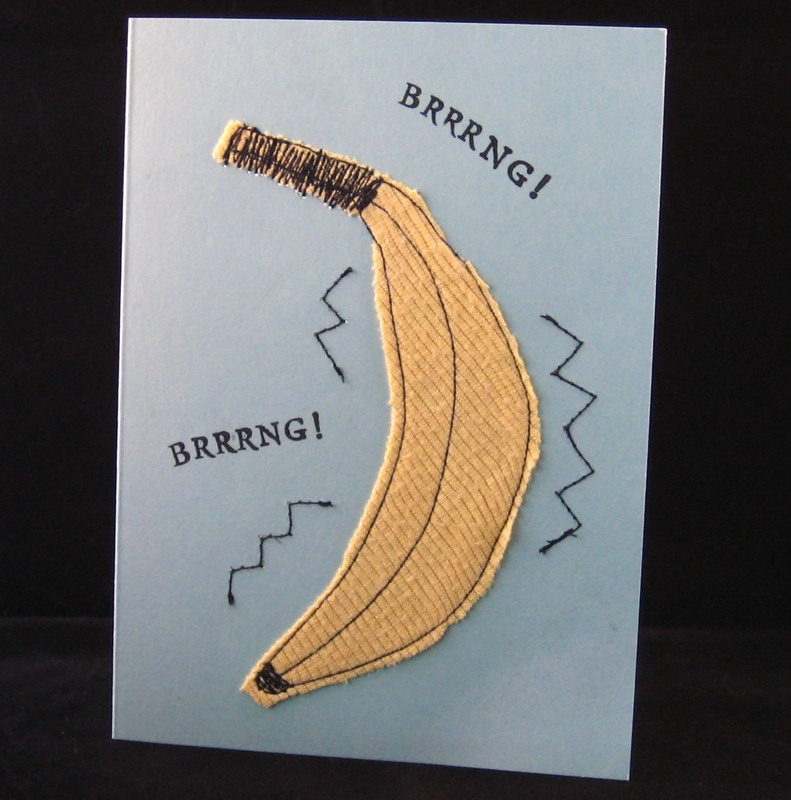 I guess I first began sewing cards because I got a sewing machine and wanted to learn to sew clothes, but I was a bit intimidated, as I didn’t have any training. I was comfortable, however, making works on paper, so I just started experimenting with the cards I made for friends and family. Once I collaged fabric onto the cards, sewing them seemed like a logical next step. To make my cards, first I think of an idea for a card. I can’t really explain it, I usually just sit down and think of a few ideas, either one that would be good for a specific occasion, or a concept I think is funny. I try to make cards that I wish already existed, that I could go to the store and buy. Once I come up with an idea to try, I make a test card to work out the kinks. I usually draw the image on tracing paper, and cut it out. Then I use the paper as a template to trace from onto the fabric. Once the pieces are cut out, I glue them onto the cardstock with acid-free glue and wait for it to dry. Then, I sew the card, and finally I stamp it with any messages included as well as my logo on the back. Once a test card is done, and I’ve decided on changes, I go through the same process again, but I do it assembly-line style, with all of the tracing first, then cutting, sewing, etc. In ten years, I hope to be working on my artworks on a full-time basis in a profitable manner. (I currently work full-time in an unrelated field). I am just at the beginning stages, but I am aiming to be able support myself with my creative endeavors. The moment we’ve all been waiting for has arrived… Please be sure to stop by and say hello! Shop a little, have a snack and tour around to some spectacular open studios. Marin Handmade will feature twelve North Bay artists, most of whom you have been reading about for the past several days. Join us today, 3-8pm at Art Works Downtown, 1337 4th Street in San Rafael in conjunction with 2nd Fridays Artwalk. Today’s featured artist is none other than one of our talented organizers, Heather Graef (www.heathergraefstudio.etsy.com). Heather’s eye for unique textiles and mix of classic and modern design is sure to convince you to get yet another handbag to add to your collection. Enjoy the interview! My early years were spent within toddling distance of Venice Beach, before my family moved to the Bay Area, and I grew up in San Anselmo and Woodacre. I studied industrial and graphic design at CCA in San Francisco, and have worked as a freelance graphic designer for over 20 years. I’ve created everything from logos to interpretive exhibit graphics programs for major natural history exhibits. With many wonderful projects behind me I found myself on a quest for other ways to expand my creativity while taking full advantage of my experience in the design field. Using a sewing machine had always been tedious, until recently challenging myself to sew a handbag—and lets be real, it was on the ugly side—but I was intrigued. Several more odd creations lead to my “Mio” bag design, and since then I have worked on honing my craft and creating a collection. I also dabble in jewelry making and other crafts. Lots and lots of thumbnail sketches, funny little mockups made with paper and staples… After developing a concept, I fabricate the prototype, rebuilding with different materials before going to my computer to create a final pattern for reproduction. I love hunting for unique fabrics and materials and often create one of a kind work, along with my regular designs. Illustrations, paintings, pottery and jewelry made by my incredibly talented family of artists. Country roads, beaches, fresh baked bread, fog spilling over the headlands, the city… My work is directly inspired by the North Bay’s urban-country culture and kick back attitude. I found a groove making bags and accessories using unique, available materials. I would love to be working with my own fabric designs and exploring the world of home décor and apparel in the future. I will always be working in different mediums and trying new things! Well folks, just a few short hours from now the North Bay contingent of Etsy will kick off its first ever event. We hope you’ll join us for what is sure to be a festive evening of refreshments, snacks and, of course, shopping! 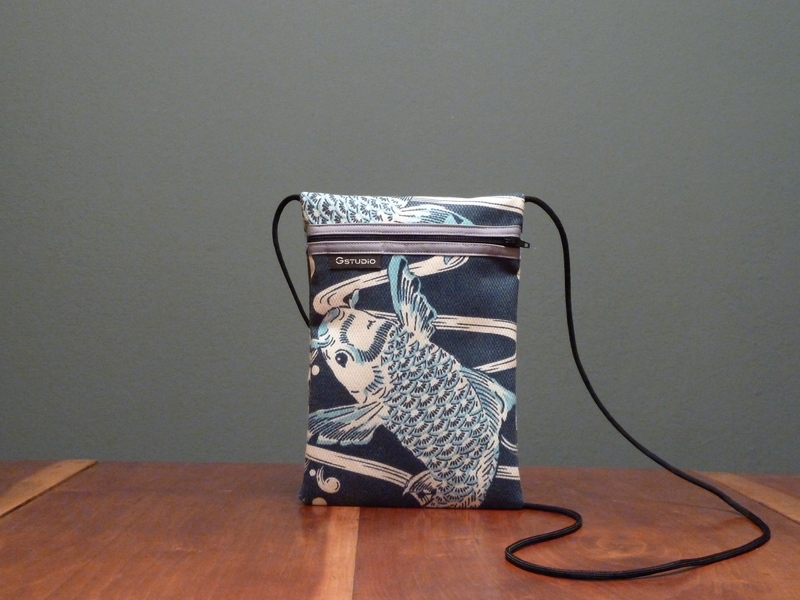 Right now, we hope you enjoy this interview with Tisha Thompson of Tisha Handmade (www.tishahandmade.etsy.com). 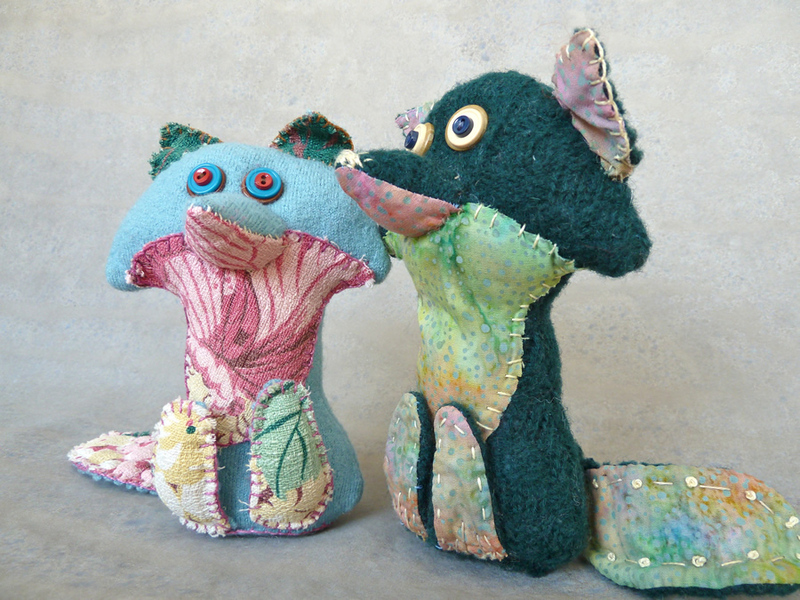 Tisha’s work spans both the functional and the whimsical while remaining true to knitting and crochet’s technical roots. I have been a resident of Mill Valley for 34 years, married to my husband John for all of those and have 2 grown kids. My husband and I now live in a very cute and very small cottage in Blithedale canyon and living here has had quite and influence on what and how I create. What kind? A fun one I hope. OK really, as of the last year or so I have been concentrating on wool. Wool in its rawest form: wool as roving, wool as yarn, wool as a fabric. I felt, knit, crochet and sew wool. I just love wool, always have. Had a sheep once when I lived in Oregon during my formidable 20s (did the hippy thing up there in the 70s) and learned to shear, dye, spin and weave wool. I have known how to knit and crochet since I was a child. It all seems so natural to me, working with wool and having fun. I have been creating hats, bags, and toys with up-cycled wool sweaters for the past year. As an avid garage sailor and thrift store enthusiast it seems natural that I would start working with felt as a fabric (i.e. shrunken sweaters). Now really, why would I want to do anything else? My friend Stephanie Green, formerly of Four Finch Custom Sewing. Her perfectionism has had a great deal of influence on my growth as a craftsperson and artist. All the women and men around the world and through the ages who have made beautiful clothing to put on their family’s backs, the jewelry on their necks and hats on their heads, are my influence. Fun, time-consuming, exhilarating and necessary to my mental well being. A Crazy quilt made by my mother with the names of great musical composers embroidered on it. First and foremost is the best art gallery & gift shop in Marin, “Roots Collaborative” of Mill Valley (2 doors down from Peet’s) where my creations are for sale. It is in this shop that I learned that people are willing to spend their hard earned money on my creations. And, the collaboration with the other artists enriches me. The weather in southern Marin suites me to a ‘T’! I love the fog. 70 years old. God willing I will be doing just what I am doing now. With the help of my friends at Marin Handmade I will have gotten a website and blog together by then and managed to grow the courage to place my work in a few more retail shops. Just a couple of days left… We are really looking forward to seeing all of our artists together in one space. 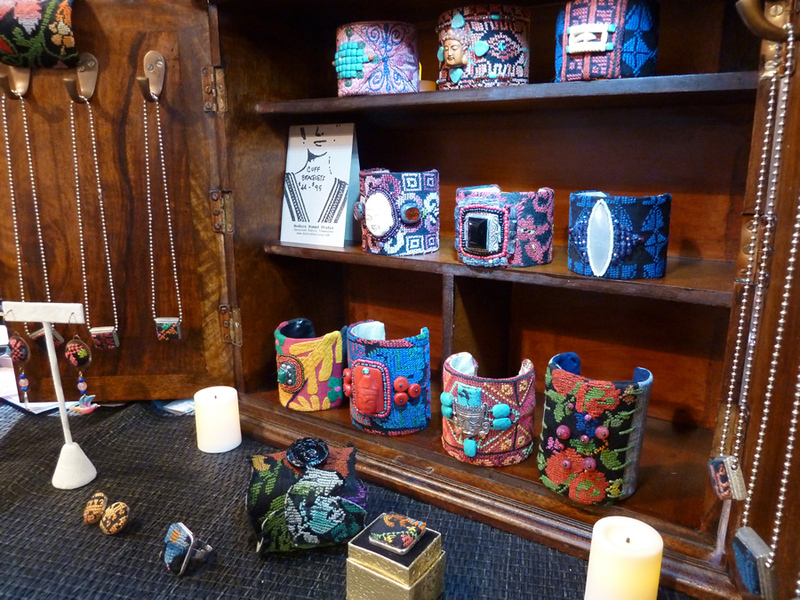 Today’s featured artist has been quite instrumental in the creation of Marin Handmade and we know you will love her work. Robin Stelling of Robin Stelling Designs (www.creativebeadz.etsy.com) has a talent for enhancing re-purposed textiles with her intricate bead work producing true “treasures”. They are are even more beautiful in person so come by and check them out! Enjoy! After earning a fine art degree from UC Berkeley, I enjoyed a career in the fields of graphic design, package design and computer graphics. One of my last video graphic clients was the Grateful Dead whose on-stage video projections I designed and produced during the last two years they toured. I moved into on-line e-tailing of jewelry supplies and fine gems about 10 years ago and have designed, created and sold my line of eco-jewelry for the past few years. I have been collecting global fabrics for many years and have always been in love with textiles. 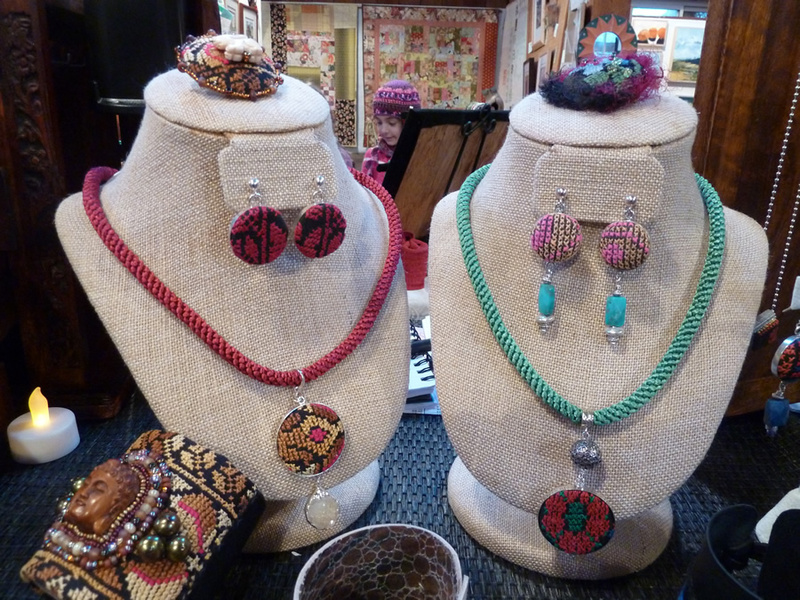 I was really excited when I realized I could marry my love of textiles with my interest in jewelry design. In 2011 I expanded the line to include my wedding cuffs made of freshwater pearls and Swarovski crystals. I live in San Rafael with my husband and two cats. My daughter went off to college this fall and I am adjusting to her absence. I have a new appreciation for ichat! I am inspired by the skill and talent of traditional craftspeople around the world whose work I restyle into treasures for the modern nomad. I find dresses and clothing from Romania, Central America and Bedouin tribes of North Africa, Egypt, Syria, Israel and Palestine that are beyond repair and save the embroidered pieces to use as my canvas. I work with the colors and textures of each piece of fabric and combine it with traditional beading techniques using glass beads, gemstones and vintage findings. My jewelry is the best way to share these collectible fabrics and textiles by upcycling and refashioning them into wearable art and accessories. I collect vintage Mexican silver jewelry. Some pieces are very inexpensive pins and earrings but are wonderfully crafted and designed and I treasure as much as the more unusual designs. I use the orphaned earrings and broken bracelets that I find in my jewelry designs. I love living in Marin and although I am not a real “birder” I often walk in the wetlands to see the variety of birds migrating each season. I enjoy participating in local shows and craft fairs and want to keep showing around the Bay Area. It’s so much fun to meet the people who love my work. My work is available for sale at galleries in San Rafael, San Francisco, Minneapolis and Guilford, CT. I hope to find more galleries across the United States to show and sell my work as well as increase my on-line sales. Well, tonight you are in for a real treat! Not only do you get to read about another of our fabulous artists, but you’ll get to know the innovative and truly beautiful work of one talented North Bay ceramicist. Tonight we are excited to introduce you to Forrest Lesch Middelton of FLM Ceramics (www.flmceramics.etsy.com) whose unusual designs and techniques produce striking and original works of functional art. Living in Petaluma for the past year, and recently moving from Fairfax, California, I have developed a fondness for the North Bay that began in 2000. While an artist in residence at the Mendocino Arts Center and dating my now wife who lived in Mill Valley, she introduced me to the area. In 1998 I graduated from Alfred University with a BFA with a focus in ceramics, and in 2006 I received an MFA from Utah State University. I have been a resident artist at the Watershed Center for Ceramic Arts in Maine and the Mendocino Arts Center. I currently direct the ceramics program at Sonoma Community Center and in 2007 developed its Artist in Residence program which focuses on ceramics. I am a ceramic artist focusing primarily on functional stoneware that employs a form of image transfer that I developed which allows me to add patterns to pots while they are being formed on the wheel. I have always loved clay. The feel of clay and its usefulness have always attracted me to it. Clay is found in every culture on the planet and to me that universality is a great place to find inspiration. I have been working with clay since age fourteen. I teach ceramics in a number of area colleges and run the ceramics program at Sonoma Community Center. I teach ceramics workshops nationally and have a wonderful wife and two daughters who put up with all of my mud and dust! These days my two greatest creative influences are15th and 16th century Turkish ceramics, and contemporary war rugs of Afghanistan. As for the who, I would have to attribute that to the long list of great teachers I have had over my years of study in ceramics; from Val Cushing and Linda Sikora to John Neely. I use printmaking processes to enhance the surfaces and aesthetic of handmade pottery. 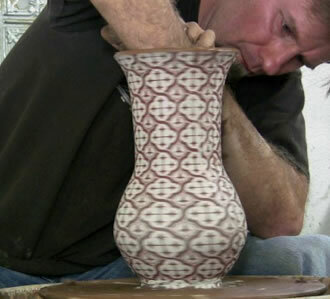 I fire my pots in a unique reduction-cooling atmosphere that gives the work an appearance akin to cast iron. The handmade possession in my home that I most cherish is a quilt that my wife and I were given as a wedding present. I am not all together certain where, or when it is from. My best guess as to its origins is that it is from rural India. It is hard not to credit the local landscape here, although I do not make work that in any way references landscape. Hikes and drives around the North Bay do however get the creative juices flowing! Hopefully teaching full time at a college or university and making artwork that is still fresh and intriguing to me and others.